6. redistribute material from this website. The full name of our company is Design For Education Limited. Registered in England Wales, details in the website footer. 1.1 Any terms or conditions sought to be imposed by either party shall not be incorporated into the Contract and shall have no effect unless agreed to in writing by the other party. 2.1 The price for the supply of goods and services are set out in our quote to you, or as agreed. We shall invoice you on delivery. Invoiced amounts shall be due and payable once the goods have been delivered. 2.2 Quotes are based on the information available and are valid for 30 days. They may be subject to increase at our discretion if for valid reason. We will warn you wherever possible where this may occur. 2.3 We shall be entitled to charge interest and a £20 surcharge on overdue invoices from the date when payment becomes due from day to day until the date of payment at a rate of 2% per annum above the base rate of the Bank of England. 6.1 We will deliver the work items within a reasonable time as agreed. 6.2 At times our website host supplier may be subject to downtime caused by routine or emergency maintenance. We will not be liable to the customer or any third party for any losses whatsoever caused by such downtime. 6.3 If in our opinion it is not reasonably practicable for any reason to carry out any of the work we are instructed to carry out, we shall be entitled to refrain from carrying out or completing such work and will consult with you as to what if any work is to be undertaken. We will, if requested by you, provide a written explanation as to why any work is not considered to be reasonably practicable. 6.4 If the cost to us of carrying out the work is subsequently increased by reason of increases in the cost materials and/or labour and/or any other factor outside our control, then we shall notify you before undertaking any work to which the increase will apply. If you require us to discontinue the work, you shall only be required to pay us for the work already carried out. 8.1 We will permit you to cancel this Agreement by sending written notice no later than 7 days after the date on which the work has been instructed. If you request cancellation at a later date, then unless we are in breach of contract, we have the right to refuse or retain all or part of your deposit as a contribution towards any losses or costs we suffer as a result of the cancellation. 8.2 If work has been undertaken on a project in good faith and upon your instruction (or non-refundable items purchased) we are within our rights not to be able to refund any deposits paid or to retain an element that is fair and reasonable to cover any time spent. Whilst we always seek to ensure complete customer satisfaction sometimes, despite our best and most reasonable efforts to resolve a situation, we regret this may not always be possible. 8.3 Once you have notified us that you are cancelling an Agreement, any sum debited to us from your credit card will be re-credited to your account as soon as possible and in any event within 30 days of your order PROVIDED THAT the goods in question are returned by you and received by us in the condition they were in when delivered to you. If you do not return the goods delivered to you or do not pay the costs of delivery, we will be entitled to deduct the direct costs of recovering the goods from the amount to be re-credited to you. 8.4 You will be re-credited for the costs incurred in returning faulty or unsatisfactory goods minus any costs incurred in good faith and upon your instruction. • 8.5.3 one or more of the goods you ordered was listed at an incorrect price due to a typographical error or an error in the pricing information received by us from our suppliers. 10.1. Except for death or personal injury caused by our negligent acts or omissions we shall only be liable for any loss or damage which is a reasonably foreseeable consequence of a breach of this Agreement. 10.2. You will be responsible for all claims, liabilities, damages, costs and expenses suffered or incurred by us as a result of your breach or default in the discharge of your obligations. 10.3. Where we need to carry out work on your premises and/or install equipment, we will not accept liability for the cost of repairing or replacing parts of your existing system which occurs due to faults in your system unless we have been negligent in not realising that such damage may occur or in the way we did the work. 10.4. In the event of our losing or damaging your goods, we will pay for the reasonable costs of the repair or replacement (less wear or tear) of the item or provide you with a full refund if we have been negligent. 10.5. Nothing in this Agreement shall exclude or limit the Company’s liability for death or personal injury resulting from the Company’s negligence or that of its employees, agents or sub-contractors. 10.6. In lieu of any warranty, we agree that if any work is defective we shall, at our sole discretion, either rectify or refund as we feel is appropriate. Under no circumstances whatsoever shall we be under any further liability of any kind. Parties to this Agreement agree to submit to the exclusive jurisdiction of the courts of England. 14.1. To protect your own interests please read the conditions carefully before agreeing to do business. If you are uncertain as to your rights under them or you want any explanation about them please write or telephone us at the main registered office address and telephone number provided. 14.2. If you are unhappy with any aspect of our service, please contact us. Any complaints will be dealt with sympathetically and we will work with you to reach a satisfactory conclusion. You consent to the computer storage and processing of your personal data by us in connection with this Agreement and to the transmission of this data across the company of our legitimate interests including statistical analysis, marketing of our services and credit control. If you breach this Agreement, your personal data may be disclosed or passed to third parties to the extent necessary to assist recovery procedures. At Design For Education, we’re committed to protecting and respecting your privacy. Any questions regarding this Policy and our privacy practices should be sent by email to hello@designforeducation.co.uk or by writing to Design For Education, 84 Queen Street, Sheffield, S1 2DW. Alternatively, you can telephone 0845 519 9105. You can change your marketing preferences at any time by completing the opt out form here: www.designforeducation.co.uk/opt-out-form/ or by contacting us by email at hello@designforeducation.co.uk or by writing to Design For Education, 84 Queen Street, Sheffield, S1 2DW. Alternatively, you can telephone 0845 519 9105. Send an email to the administrator here and request the information held about you at hello@designforeducation.co.uk or by writing to Design For Education, 84 Queen Street, Sheffield, S1 2DW. Alternatively, you can telephone 0845 519 9105. Send an email to the administrator here and request the information held about you is erased at hello@designforeducation.co.uk or by writing to Design For Education, 84 Queen Street, Sheffield, S1 2DW. Alternatively, you can telephone 0845 519 9105. 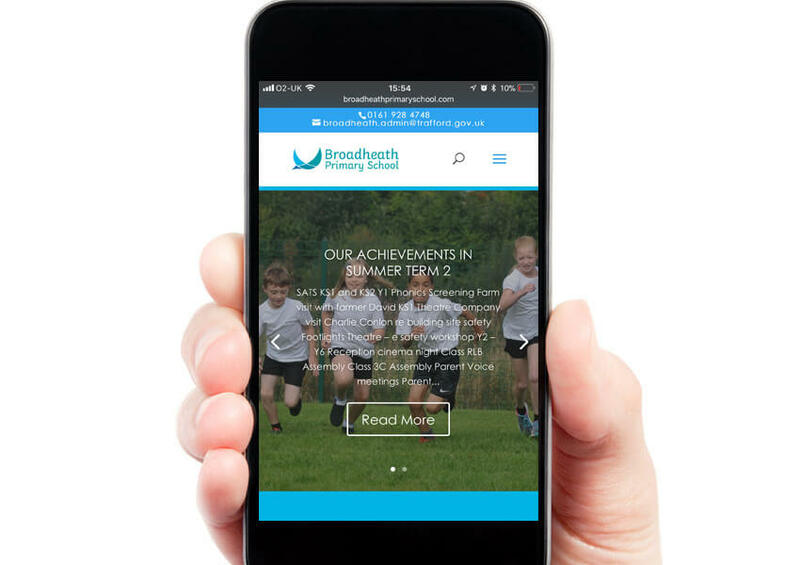 The school logo and branding at Broadheath Primary was in desperate need of a refresh. It had been in place for as long as anyone could remember and the new school build provided the perfect opportunity to re-launch the schools brand. Having an Ofsted compliant website which is accessible on mobiles, tablets and desktops is an essential part of any schools communication strategy. Our new school website packages offer this and more. To celebrate the launch of our new website packages. We are delighted to offer all Design for Education Customers a £500 grant backed by our new digital partners Nettl. Nettl is a national brand in website design with over 100 web studios across the UK. Our partnership enables us to utilise our experience developing websites for the education sector, backed by a robust infrastructure in terms of hosting, support and security that you would expect from a national market leader. As part of this partnership, Nettl has set aside £50,000 in grants to help schools improve their online presence. Due to this cap we are offering the grants to our customers first before they are offered to other schools. If you are considering updating your website or are concerned that your current site is not meeting the needs of your parents and Ofsted then we would love to have a chat and see if we can help. If you would like to see some websites that have been built on our new platform take a look at our websites case studies. You can find out more by visiting our School Websites page. Following the successful rebrand of St Matthews Primary school, the SLT wanted to capture the official opening day with a launch video. Our film crew arrived at the start of the day to capture parents and children arriving at their new school.